A lot of people express a preference of trains over buses. I suspect it’s mostly about ride quality. Railed vehicles are generally going to be smoother than tyred vehicles. And there’s also perception of permanence (and in Melbourne, perception of service quality, since trains and trams all run until midnight every day, whereas buses are somewhat patchy). In the theoretical world of public transport planning, it comes down to the capacity and speed required. Trunk routes needing to carry thousands of people per hour need to have high-capacity vehicles, and once you get over about 200 people in a single vehicle, you pretty much have to go to rail. But rail is expensive, and so you’re never going to get it everywhere. Many parts of Melbourne will never have rail, which is why it’s vital to provide some other mode into those areas, running high quality (frequent) services. For buses and trams, another aspect to consider is right-of-way. Do the vehicles run in mixed street traffic, or a dedicated lane on an existing street, or a completely separate right-of-way? Buses and trams can run in any of these; heavy rail can only operate effectively on the latter. 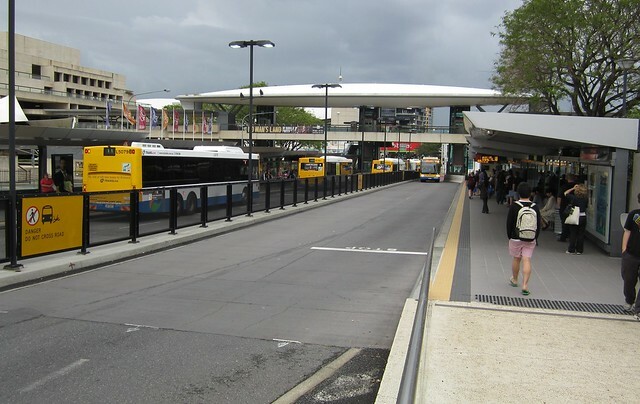 One of the notable things about Brisbane is that in recent years they’ve invested in busways… effectively bus-only freeways — known as Bus Rapid Transit in PT planning circles. 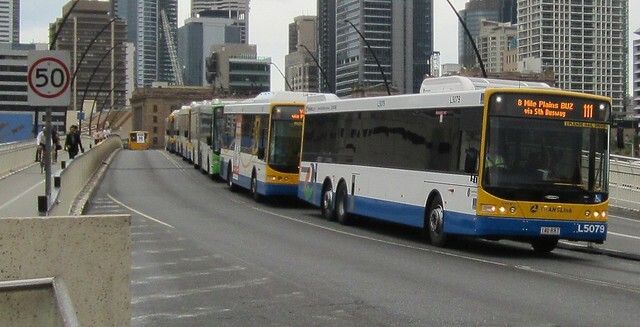 The result is relatively low-capacity services (conventional or bendy buses), that run quite fast on the busways (since they have no other traffic to deal with except other buses). They can run at high frequency, and in spots where they need to, they can operate on normal streets. In Brisbane’s case, some routes operate on the street in the CBD, and also at the outer suburban ends, using the busway in between. Melbourne’s only comparable routes are the freeway buses to Doncaster and Altona, but these don’t have separate lanes (just part time bus lanes in some sections). 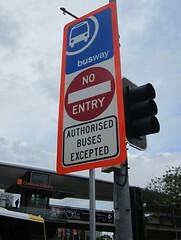 There are two major catches to busways: firstly they’re quite expensive to build. One recent one kilometre stretch cost $465 million — more expensive per kilometre than Melbourne’s $562 million 3.5 kilometre South Morang rail project (only a portion of which was the actual rail extension). 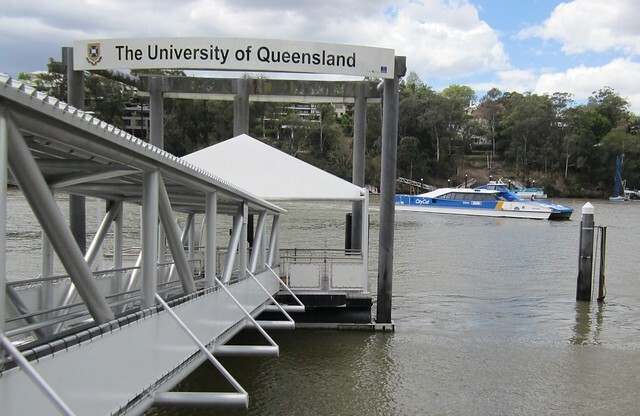 No doubt part of the huge cost is due to Brisbane’s primarily being in the inner-city, thus involving lots of bridges and tunnels — if one compared like-for-like then in theory the busways should be cheaper than rail. The second catch is that they have limited capacity. Brisbane’s are becoming so popular that now they’re hitting the capacity limits — of the buses and of the busways. We saw this while in Brisbane, at the Cultural Centre station. These buses are heading out of the city at evening peak. It must be really frustrating to be stuck in a bus queue like that — both for passengers and drivers. 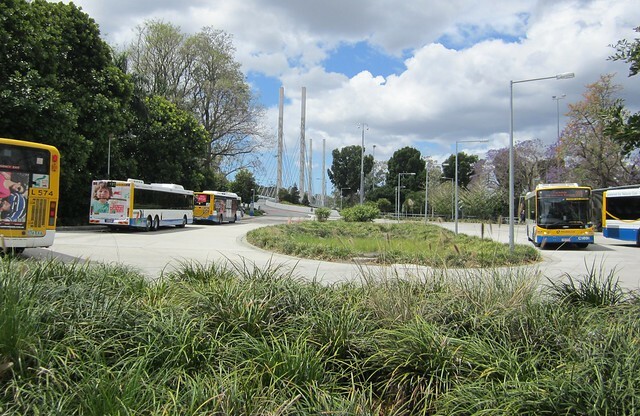 And because of the fencing on one side of the bus way, and traffic lanes on the other side, if things got really jammed up, it might not be possible for passengers to abandon the bus and walk (which is what tram passengers do when St Kilda Road jams up). Capacity also becomes a problem with regard to storage. This also happens for trains of course — all the vehicles used at peak hour need to be stored somewhere. The number of drivers involved also needs considering. A single six-carriage train might carry the equivalent of about 10-12 conventional bus loads of people, but with only a single driver. This is the debate at present over some rail corridors such as Doncaster in Melbourne. The current buses provide high frequencies, but require a lot of labour to do it. Trains could move as many people and more, using less labour, but would the resultant frequencies be high enough to attract passengers? The bottom line here is that good effective planning is needed to anticipate the current and future capacity required, the transport mode needs to be chosen appropriately. 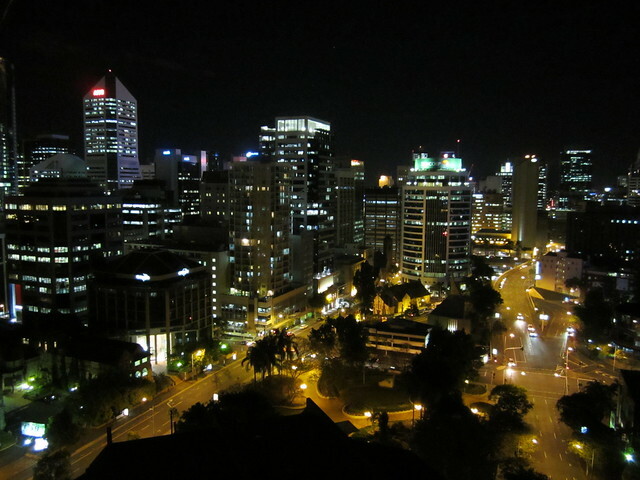 Alas, the day came to depart Brisbane and head back home. After checking-out (and verifying that a hole in the wall in one of the bedrooms wouldn’t be a problem — it was caused by a bed on rollers in a tiled room, with nothing to stop it moving around) we headed down to Central station to catch the airport train. I’d had a message from the Queensland PTUA-equivalent Rail Back On Track’s Robert Dow early in the morning to say there was going to be a ministerial announcement at Central, at 10am, about the time we’d be heading out. When we got there, we quickly spotted the media pack, and Queensland’s Transport Minister Annastacia Palaszczuk, who was announcing that the airport train is to have its hours extended, from the current time of 8pm (which is hardly satisfactory given flights continue for some time after that), to 10pm — starting in December. After the Minister did her grabs, Robert fronted the cameras to make some approving remarks. He then grabbed me and introduced me to the Minister as his Melbourne equivalent, and we had a quick chat… I told her Melbourne could learn a lot from Brisbane’s public transport network, and the only major problems we’d had during our visit was the low frequencies of trains at off-peak times, which she seemed to agree with. Robert also introduced me to some Translink people, and I asked them about the bus/train coordination we’d seen the day before. I asked if it was the Translink governance structure that makes this possible, eg how the Translink organisation works with the individual operator companies such as, in this case, Queensland Rail and Surfside Buslines. 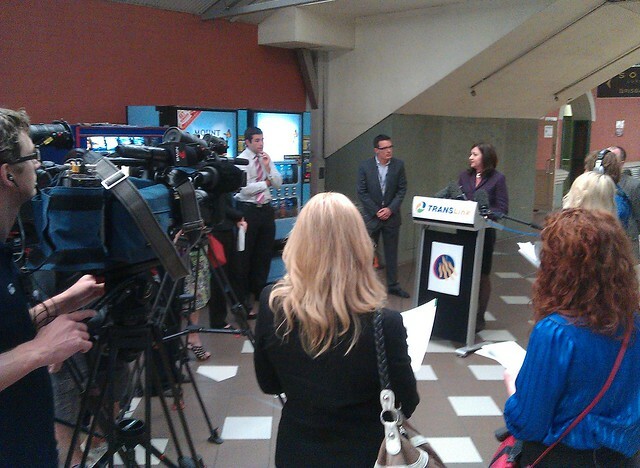 They said yes — the operators write timetables within Translink’s guidelines. Rail is done first, then bus timetables are written to match. They see it as really important given 30 minute train frequencies outside peak. This is something Melbourne definitely needs to learn from, and the hope is that the Coalition Government’s planned Public Transport Development Authority will do here what Translink is doing in Brisbane. After a bit of a chat, we headed down to the platforms for our train to the airport, and made our way to the Domestic terminal to check-in. Not so fast, said the check-in kiosk machine thingy — we’d need to go and see a human. Uh oh, this couldn’t be good. It wasn’t. The human told us that a late-arriving international flight had caused the middayish Brisbane to Melbourne flight we’d booked to overflow, and we’d either have to fly via Canberra (arriving in Melbourne around 6pm) or get onto the next direct flight with seats, which wasn’t leaving until about 8pm — which allowing for two hours flight time, and an hour to adjust for daylight saving, would have meant getting back to Melbourne at about 11pm. Blargh. Canberra it was then. Didn’t Jerry Seinfeld do a standup bit on this topic on his TV show? It might have been about hire cars not being available despite having a reservation. I seem to recall that he doubted that the company understood the concept of a reservation. 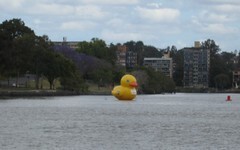 Apparently this escapes Qantas as well. 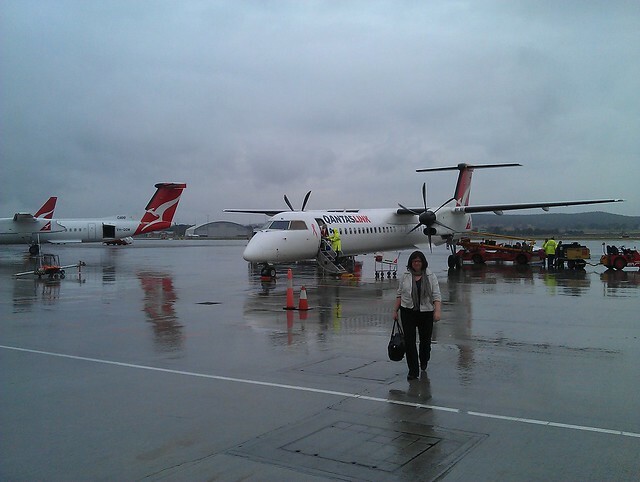 So we went and waited for the Canberra flight, which turned out to be delayed. I was cursing myself for throwing away the (disposable) water bottles just before we were told of the delay. Damn. Could have refilled them at a water fountain. While we waited, we heard final boarding calls for a missing group of four passengers for what should have been our flight home. Blargh, we thought — kicked off our plane, and four people who took our seats didn’t even bother to turn up at the gate. The flight to Canberra was delayed by about an hour, and we went and got some lunch from the food court, at exhorbitant 50% higher airport rates, of course. 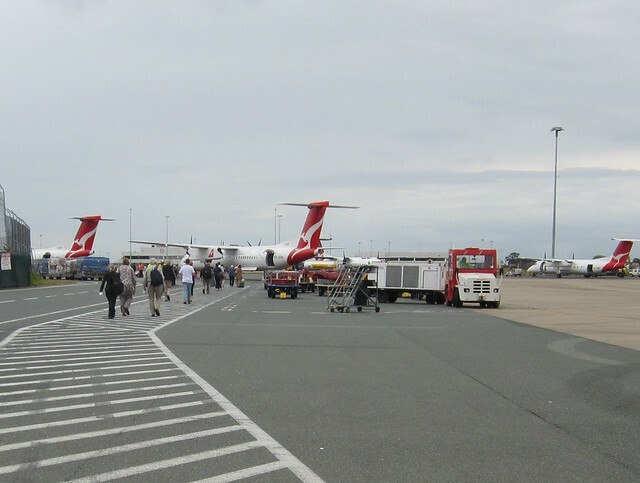 Then eventually we boarded, with a walk along the tarmac, to our waiting Dash 8 aircraft. I suspect the prospect of a propeller plane made Jeremy a little nervous (or maybe he was bummed about there being no inflight entertainment), but the flight was without incident, and we actually got a decent feed on-board. I had hoped that it would have been clear enough to see some of our nation’s capital as we flew in, but there was a lot of low-level cloud, and nothing to see except fields close to the runway. We had about an hour to wait before our connecting flight, and thankfully could just mooch about in the terminal without having to worry about the luggage, which had been checked straight through. I found and purchased a Mad magazine compilation of sci-fi spoofs for the boys to read on the next plane. Boarding again at about 4:30, we found this time the plane was full of suited businessmen and public servants (I assume) heading out of Canberra. Almost all of them appeared to have those cases which are effectively luggage, but which are allowed as carry-on, resulting in the overhead lockers being absolutely packed to the gills. No doubt they all do it to avoid having to avoid the hassle and delays of checked luggage, but I wonder if it adds to the boarding times. Some in-flight delays resulted in us arriving a bit after 6pm, and we found the luggage (only after Jeremy found the right conveyor, which was behind some hoarding) and boarded the Skybus. After one false turn at Southern Cross (seriously, they could make the route from Skybus to/from the suburban trains MUCH easier) we found the platform for our train home. I was just checking the departure board when I heard a shout of “Hey Daniel!” It turned out to be former Public Transport Minister Martin Pakula, on his way home. 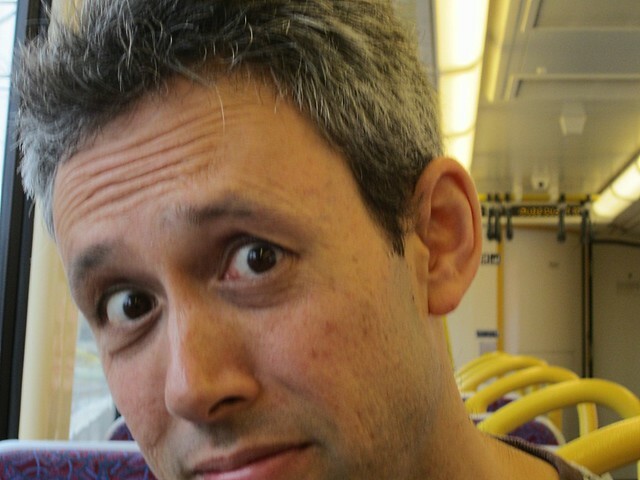 We chatted on the train for a little while, as far as Flinders Street where he changed. I assume in opposition he doesn’t get the use of a driver and car, so he might actually be on the train more often than when he was the minister. It was smooth sailing from there; we finally arrived home around 8pm after a long day of travelling. The first job was to return the hire car. Similar to the circuitous route filling it up the night before, due to the one way streets, this involved a 750 metre drive (Google Maps estimated time: 4 minutes), and then a 170 metre walk back (estimated: 2 minutes). Turning out of Raff Street I also needed to remember the counter-intuitive instruction to Keep Right. 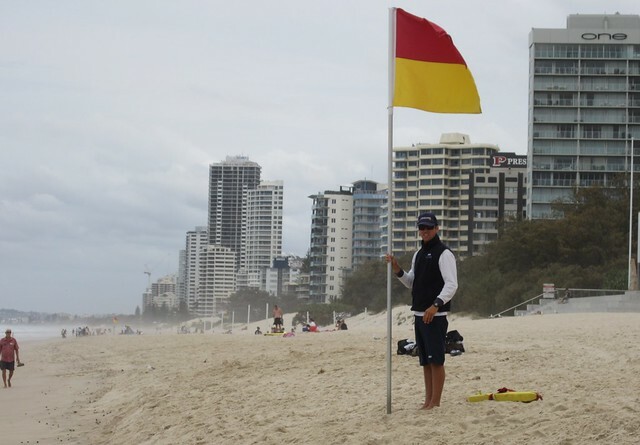 The plan for Wednesday was to head down to the Gold Coast — Surfers Paradise to be precise — to visit the beach and see where my sister and her family and another brood of cousins were staying. 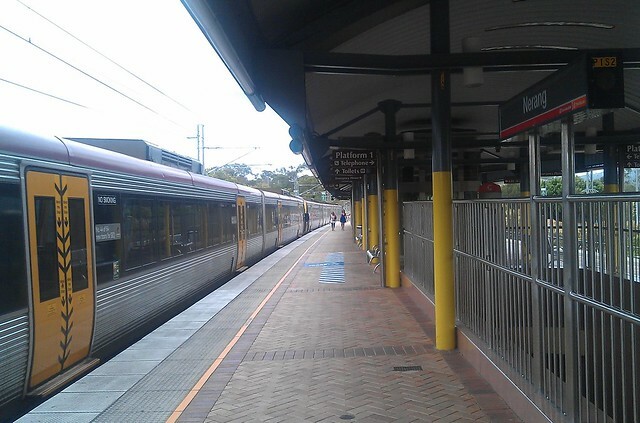 Trains run on the “Gold Coast line”, but not to the actual coast. However the good people at Translink have got things organised so that — and I know this will come as a shock to Melburnians, who are not used to such concepts — the buses are actually timed to connect with the trains. So in our case, the Translink Journey Planner reckoned we could simply hop on a Gold Coast line train (every half-hour from Central), hop off at Nerang, and 7 minutes later the 745 bus would depart for Surfers Paradise. Along with the integrated (Go Card) ticketing, it can’t be emphasised enough how important good connections are to make a wider variety of journeys (eg the many, many not possible using a single service) easier by public transport. Even on holiday, I apparently gave the impression that I knew where I was going (or perhaps it was that my snapping pictures screamed “Transit nerd”), as a couple of guys at the bus interchange showed me their (paper) train tickets and asked if they’d work on the bus. I said I thought so, and evidently I was right, as the bus driver waved them aboard. Checking now, Brisbane/Central to Nerang is zones 1 to 14, and the bus is zones 14 to 13. Come to think of it, I’d also been asked for directions in Brisbane, to the nearest supermarket, and was able to point the people in precisely the right direction. Anyway, the bus journey allowed us to check out some of the Gold Coast architecture. It’s not exactly the Las Vegas scale of garish, but it certainly has the holiday vibe, with a diverse range of building styles (within the high-rise genre, I mean), and many buildings being hotels and thus having their names printed in big letters on the top — no doubt an aid to tourists trying to find their way back to their accommodation. 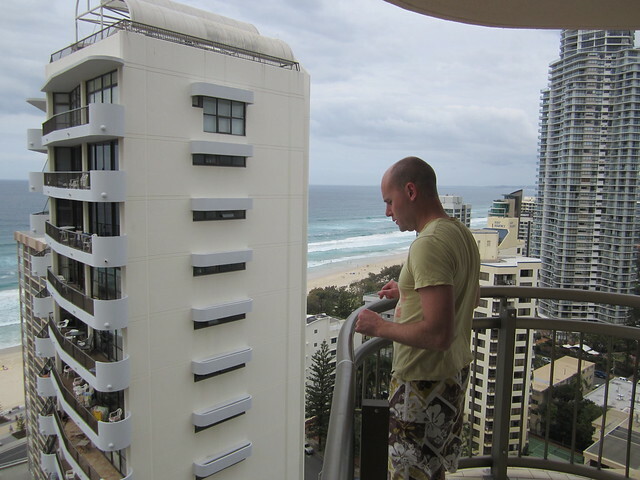 The bus pulled in at Surfers Paradise and we found our way to the Beachcomber building, a slightly disshevelled hotel/apartment block near the beach where the family was staying. After checking out the view, which was excellent, we headed down to the beach. It was a bit cold for swimming, but we enjoyed some paddling, sand castle-building, burying peoples’ feet in the sand, all that kind of thing, for a while, before heading back upstairs and having some sandwiches for lunch. 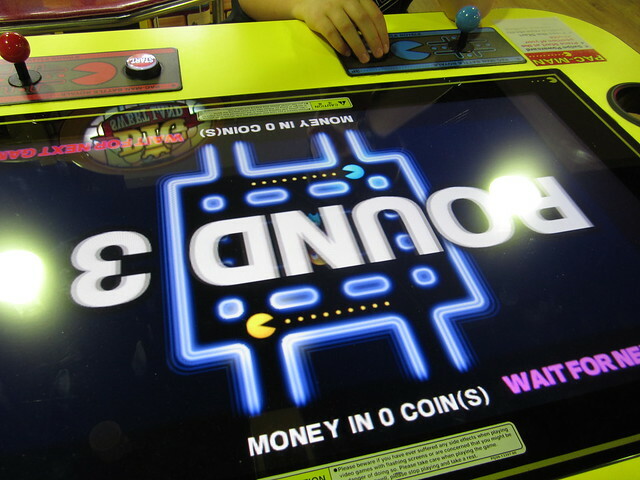 My sister, being the wise Auntie that she is, let us know of a big arcade (in the “arcade games” sense of the word) nearby, and myself and Isaac and Jeremy headed up to look at it with bro-in-law Adrian and his kids. It turned out to be another Timezone — and according to the signs, the biggest Timezone in the world, no less. I’d believe that. It was vast. 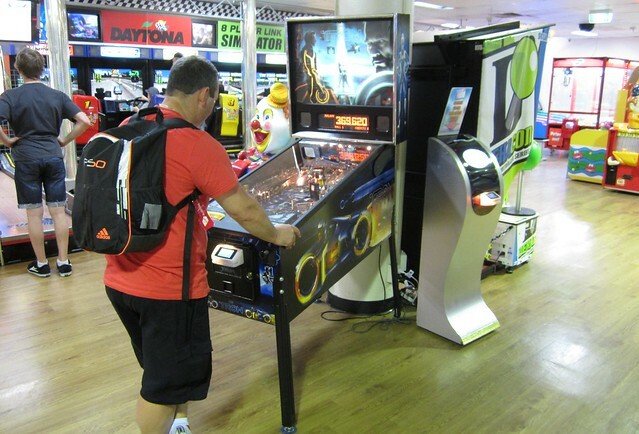 It took perhaps a good ten minutes just to walk around it initially to size up what it had, which included many many games (just about all newer stuff; little in the retro genre alas, though there were several pinball machines), dodgem cars, virtual reality thingies, shooting ranges, laser tag, a mini bowling alley, mini golf, and heaps more. We scattered into various corners for a while to enjoy our preferred amusements — for me it was mostly pinball to be honest. True to form, my first game was the best, and I got steadily worse after that. After a couple of hours the money loaded onto our cards started to run out, and the noises and flashing lights were beginning to be a bit much, so after retreating back to the apartment for afternoon tea and a rest, we headed out for dinner nearby — on a recommendation, a Turkish/Italian place around the corner, which served up some most delicious food. Before too long we were back on the bus to Nerang, and then the train ride back into Brisbane. Just as in Melbourne, being an evening train there were copies of MX to be found to read along the way, and although the sign at the back said the toilet was out of order, it seemed to work just fine. We rolled into Central about half-past eight, and headed back to our hotel for one last good night’s sleep. Brisbane day 4 – can you identify the animal? It was time to go bush. 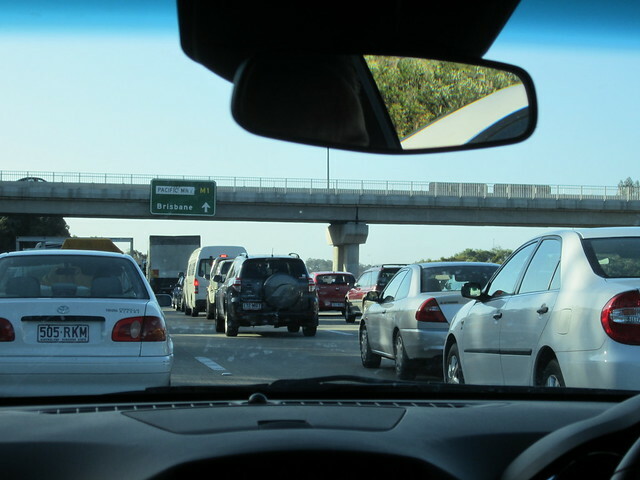 We picked up a booked car at Europcar (around the corner from the hotel, though it turned out Thrifty was also close-by) and after some negotiating of central Brisbane’s one way streets, found the Pacific Motorway. One way streets don’t affect one as a pedestrian, but certainly make themselves obvious in a car. It’s not something I think about in Melbourne, where thanks to Robert Hoddle all the main streets run in both directions, but from my observations, Hobart, Sydney and Brisbane all have narrower main streets, many of which over the years have been switched to one way. We stopped off at Westfield Garden City (though finding it was not without its challenges — I had assumed it would be an easy detour off the motorway) to buy Isaac a hat, and also to see if we could locate the local Gametraders store, which I knew Jeremy would be keen to check out. The hat was easily found, but the Gametraders had disappeared, despite being listed on Google Maps and in the directories inside the centre. (The authoritative source, the Gametraders web site is a Flash-dominated monstrosity that does not display properly on my phone.) The lady at the ABC shop, opposite where it should have been, said it had only recently gone. 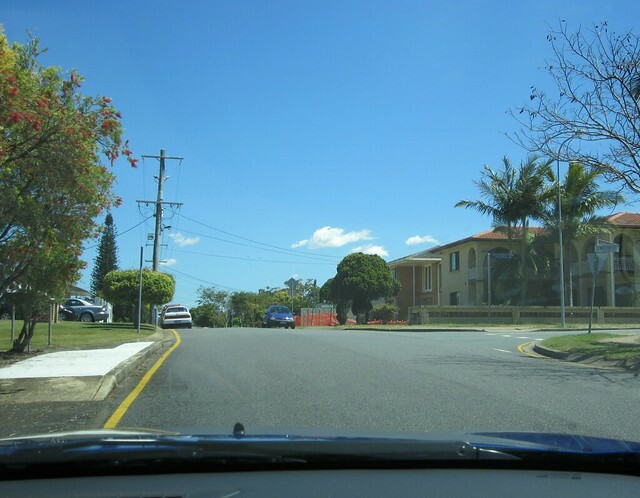 On we journeyed, managing to go in a complete and lengthy circle around the lovely parkside suburb of Macgregor, and then back into the shopping centre before we found the entrance onto the motorway again. 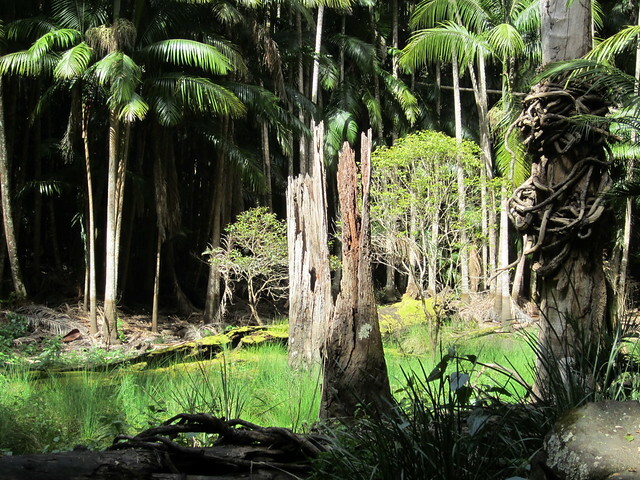 No such geographically-challenged navigation on the rest of the trip to Mount Tamborine and the Rainforest Skywalk, though we did observe a bloke in a 4WD reversing out of a car park space bowl-over a sign, despite having being guided out of the spot by an attendant. 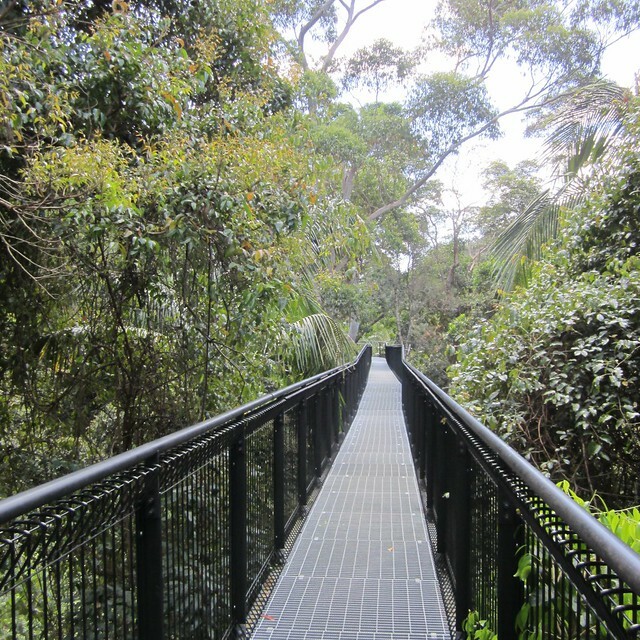 The Skywalk was quite enjoyable… initially along walkways high off the ground, among the treetops, and then heading back to the visitors centre along paths in the undergrowth. We had lunch there, and then headed onwards. The lady at Europcar had recommended the cheese factory, which is co-located with the brewery. That looked interesting, and would have been a good spot for lunch if we hadn’t already eaten, so we headed for the next stop, the Witches Falls circuit walk. This 3.1 kilometre walk took us all the day down from the top of a ridge to an area perhaps halfway up the mountain, in a zig-zag (like a giant, real-life Donkey Kong). There was some spectacular scenery, including those weird trees that grow around other trees — like a super-powered version of the creeper in my garden. Along the way we saw a relative of the kangaroo… not sure what it is — don’t think it’s a wallaby, and it’s too big to be a potaroo. Can anybody identify it? There were also several bush turkeys, and eventually we got to the very impressive waterfall lookout, before heading back up to the top. We explored a few other spots around the mountain, stopping for ice-creams and then at a fudge shop, where a procession of kids who seemed to be constantly asking for samples of various flavours amazed me by actually buying some fudge. Sometimes I’m too cynical. Anyway, we bought some and then hit the road. I had wondered if we could make it back up the highway to Logan Hyperdome, where during the day I had verified that there was still a Gametraders. I verified it by ringing them up and asking what time they closed. 5:30. This would have worked, too, if we hadn’t encountered roadworks heading back to the highway, and then a dreaded portent: a sign warning of major delays near exit 41. Sure enough, it was major delays, and we probably spent the best part of an hour in stop-start traffic. The radio said rocks were on the road (presumably fallen from a truck) and they’d even called in a bobcat to clear it up. Eventually we got past it, but it was right on 5:30, with no hope of getting to Logan on time. Oh well, we tried. Instead we pulled off the road, stretched our legs and ate some fudge as compensation. The rest of the journey back to Brisbane was fairly uneventful, apart from some more (minor) delays on the Riverside Expressway, and more battling of the one-way streets to firstly fill up the car, and then get back to the hotel carpark — while the petrol station was only a stone’s throw from the hotel, in the car it was about ten times that far. In fact Google Maps reckons it’s 200 metres vs 1200 metres. We spent the rest of the evening ordering and munching on pizza, watching TV and admiring the view. 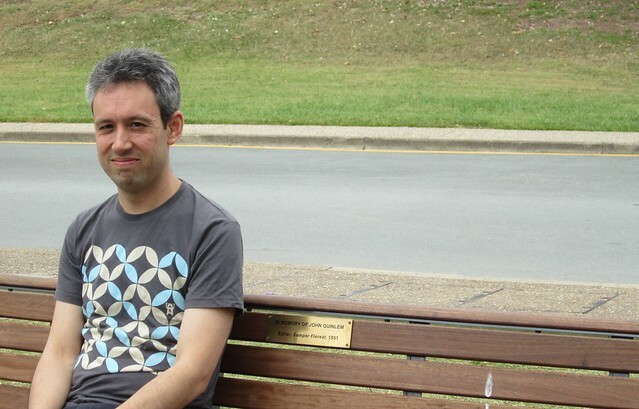 Day three in Brisbane, and it was time to get to the whole point of the trip: to visit my Dad’s memorial bench at the University of Queensland. After waiting for my Uncle Frank (Dad’s last remaining sibling) to arrive (his bus was delayed), we headed down Adelaide Street to find the 109 — not the 109 tram I’m more familiar with, but the 109 bus to UQ’s St Lucia campus. We probably should have checked which bus to catch down Adelaide Street, because it was a long walk to the relevant stop, but eventually we found it, and didn’t have long to wait. The bus headed across the river, along Brisbane’s much-vaunted (at least by Bus Rapid Transit enthusiasts) and rather impressive (no matter who you are) bus ways. More about this, and Brisbane’s PT in general, in a later post. We arrived at the UQ campus, and strolled over to where we thought the bench would be. As we approached, I noted a crowd around one bench, and remarked that it would be embarassing if that was the bench we sought. A group of perhaps 30 students was crowded around it, having a picnic. Somehow my sister managed to find their leaders and ask politely if they’d mind moving… which they very gracefully did, though it appeared that rather than move, they broke up their party. Oops. Anyway, there we finally were: the memorial bench. It was a nice spot. Despite nearby building construction, a very peaceful location by the lake. Dad would have liked it, I think. The bench is nice too, and with a bit of luck should be there for a good few years into the future. 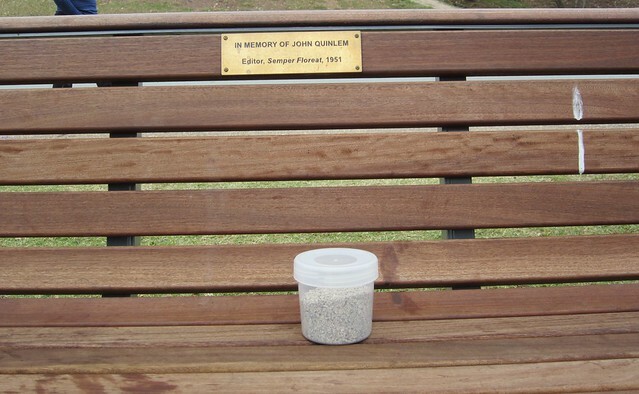 We had a small container with some of Dad’s ashes, and sat him on the bench, before scattering some of them into the lake, and snapped a few pictures. A passer-by helpfully took a photo of all of us. Frank pointed out the Regatta Hotel (after which the Regatta wharf City Cat stop is named), and recounted the incident when Merle Thornton (mother of Sigrid) and Rosalie Bognor chained themselves to the bar in protest against men-only public bars. He reckoned Dad knew Merle and her husband, and had later been an occasional babysitter for the young Sigrid in London in the late-60s. We got off the ferry at Southbank. Frank verified that it was indeed the same area that I remembered from visiting Expo 88 when I was but a teenager. It’s quite different now, though I recognised one of the towers from my earlier visit. We found some lunch (sandwiches or kebabs, according to preference) and ate while a rainshower came through, drenching anything and everything not undercover. My sister and her family were keen to head towards the Gold Coast before too long, so we found South Brisbane Station and caught a train with them back to Central so they could collect their baggage. As we left Central, it started to pour down, and for a while we took cover and watched the rain come down. I took the opportunity to try out the slow-motion filming on my camera — very cool. At some point Adrian and I decided to dash for the baggage, and everyone else went back into Central station to find a hot chocolate. We met up a little while later, and everyone boarded a train for the Gold Coast, with my mob and Frank getting off again at South Brisbane to go look at the science museum. Alas, the science museum was closed, renovations until January. Instead we headed over to GOMA — the Gallery of Modern Art, and had a look around there. We’d just missed the Surrealism exhibition, which would have been quite interesting, but instead had a look at an exhibit of modern art from the Torres Strait, which Frank noted was where our Chinese ancestors had initially settled before moving on to Brisbane during WW2. There was some interesting stuff, though the boys at one stage decided to just sit and chat on a comfy couch rather than walk around the gallery… fair enough. After that we walked to the Cultural Centre busway stop, and thanks to the excellent Translink mobile journey planner web site (why doesn’t Metlink have that? ), I was able to tell which buses we could catch to a stop back closer to the hotel than we’d set out from that morning. We farewelled Frank and headed back to the hotel for pasta, TV and sleep.